There are a number of apps available that will turn your Android device into a handheld Wi-Fi analyzer. A quick search on Google Play will give you a complete list. 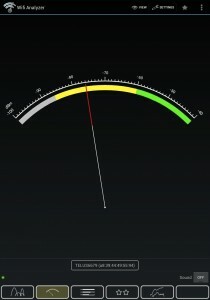 One of the most popular, and my favorite, is Wifi Analyzer by farproc. It gives you a choice of seeing the local Wi-Fi environment in Channel Graph, Time Graph, Channel Rating, AP List, or Signal Meter mode. You can monitor SSID names, MAC addresses, channel numbers with their frequency, security type, and signal level. Best of all, it’s free. There will be ads on the bottom of the screen and if you find them annoying they can be disabled for up to two weeks at a time. For simple WiFi troubleshooting and coverage maps you don’t need a great deal of technical knowledge so don’t be intimidated by the jargon on the screen. A smartphone wifi analyzer will not give laboratory quality measurements but for our purposes relative measurements will be good enough. On a side note, this functionality is not currently available on iPhones. Apple has recently chosen to restrict access to private frameworks in the latest versions of their iOS operating system. This prevents app developers from accessing the required data. There are WiFi apps for versions older than iOS 5 that will still work as long as the device has not been upgraded. You can however get applications for Mac desktop and laptop computers to do Wi-Fi analysis, at the cost of significantly reduced portability. For the sake of simplicity, the directions in this article will refer to WiFi Analyzer by farproc. Other Wi-Fi apps will be similar. Refer to their help files for specific instructions. To find the best available access point use the ‘Channel Graph’ view. If it isn’t the default on startup press the Menu key. It’s at the top right and resembles an eye. After selecting ‘Channel Graph’ view you will see a visual display of all the current access points within range. If you’re at a business with their own Wi-Fi, that will usually be the best choice. If not, be sure to monitor all the choices for a minute or two before trying to connect. It’s common for the weaker ones to appear to have useable strength for a moment then disappear. You want one with a consistently good signal. The WiFi Analyzer app has the option of marking open networks with an ‘*’ so you don’t have to try them all to find one you can connect to without a password. On the 2.4 GHz band, your preferred choice will be a strong signal on one of the three least overlapped channels (1, 6, and 11) that doesn’t have any other strong signals on it. Tap the top left hand corner of the graph, under the app’s icon, and it will switch to a display of activity on the 5 GHz band. There are a lot more non-overlapping channels on 5 GHz so you may have better luck there if you are able to use them. 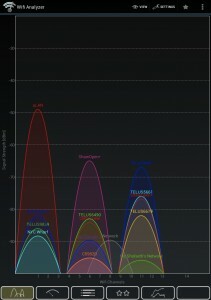 The ‘Channel Graph’ mode can also be used to make a rough coverage map of your home or office wireless network. If there are too many other signals cluttering the screen, switch to the ‘Signal Meter’ mode. If after changing modes your network is not the one being monitored, press and hold the label showing the current selection until a menu comes up. Tap ‘Select AP’, then pick your network from the list. It’s important to realize that Wi-Fi analyzer measurements are in dBm and the values will be negative numbers. You don’t have to know what dBm means but when you are looking over your notes later, remember that -40 is a larger number than -50 and that zero is larger than any negative number. Before you begin, draw a diagram of your home or office layout. Then go from room to room, noting the signal strength and marking each reading at the appropriate place on your diagram. With WiFi, updates will not be instantaneous like you would expect from an AM/FM radio. Move around slowly and allow the app time to update. It may take 15 seconds or more to notice any changes. Every phone is slightly different. Always use readings from the same device for making comparisons so you have a consistent base line for your measurements. Generally speaking, the weaker the signal, the more unstable the readings will be. If it keeps changing use the lowest number. When you’ve got readings from every room in your home or office you should have a pretty good idea of the extent of your coverage. You can now take the necessary steps to fill in any gaps. If you’re unsure how interpret the displayed data or if your chosen channel is not working as well as you think it should, try the ‘Channel Rating’ view. It will give you a recommendation based on all the current traffic. Press the app’s menu key, then press ‘Set my AP’. Select your network from the list. The display will now show your network’s current channel plus a rating of 0 to 10 stars for that channel and all other channels. They ratings will change over time. Watch it for a while to see which channel has the most consistently high rating. Because of its programmability, a smartphone is able do things that used to require expensive test equipment. Often it does them better than dedicated equipment did before the age of computers. As an added benefit you get a better understanding of how your WiFi system works. If you need WiFi connectivity beyond normal limits, get long range WiFi hints, tips and equipment recommendations at: http://extendwifirange.net. This entry was posted in Products and tagged android app, troubleshooting, wi-fi, wireless networks by Mark Gap. Bookmark the permalink.